Species 6 or 7, in both the Old World and the New. Type species: Panicum gibbum Ell. 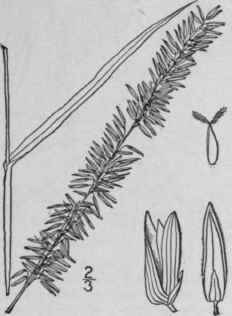 Holcus strialits L. Sp. PI. 1048. 1753-Panicum striatum Lam. 111. 1: 172. 1791-Panicum gibbum Ell. Bot. S. C. & Ga. 1: 116. 1817. Sacciolepis gibba Nash, in Britt. Man. 89. 1901. S. striata Nash, Bull. Torr. Club, 30: 383.. 1903. Culms erect from a creeping base, 2°-6° tall, dichotomously branched below. Lower sheaths densely hirsute, the upper generally glabrous; blades 3'-7' long, 2"-10" wide, usually spreading, more of less pubescent; panicle 3'-9' long, dense and contracted; branches 1/2'-1' long, erect; spikelets 1 1/2"-2" long, elliptic, somewhat acute; first scale about one-quarter as long as the spikelet; second scale gibbous at base, 11-nerved; third scale about equalling the second, 7-nerved, empty, the fourth one shorter than the second. Swamps, New Jersey to Oklahoma, south to Florida and Texas. Also in the West Indies. July-Sept.